Cancer-causing benzene wafted across suburbs of the fourth-largest U.S. city Thursday, shutting roads, schools and industrial plants, and disrupting normal life for half a day. A major oil refinery in the heart of North America's most important fuel-producing region told workers to stay home and the Texas National Guard deployed troops to assist with air monitoring. The benzene probably arose from charred chemical tanks as overnight winds stirred remnants of their contents, owner Intercontinental Terminals Co. said. Even after the working-class suburb of Deer Park rescinded an order telling everyone to shut their windows and stay inside around lunchtime, the reprieve may be temporary, scientists warned. Warm temperatures that are swirling the air and dispersing toxic fumes will disappear after sunset, potentially allowing benzene to settle at ground level, said Jeff Evans, the meteorologist in charge of the National Weather Service's Houston office. "The air is mixing vertically now but what you need to watch for is tonight" when those conditions cease, Evans said. 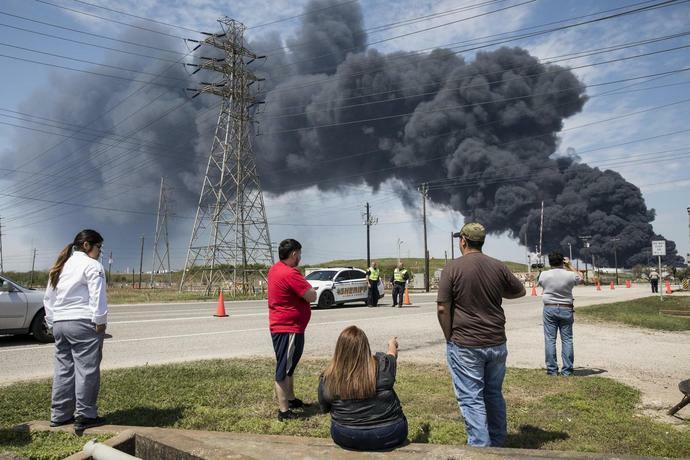 But with the fire at Intercontinental's storage complex extinguished, the situation is actually more treacherous because the pools of naphtha and other crude-oil byproducts at the site are no longer burning off -- and are free to evaporate at ground level. "It's making the dangers worse for the communities near the site," said Daniel Cohan, associate professor of civil and environmental engineering at Rice University. "The fires that had been burning had been burning off many of these air toxins and wafting them into a plume higher into the sky, where it was able to spread and disperse into broader regions." Police began dismantling barricades erected before sunrise in Deer Park, 18 miles (29 kilometers) east of downtown Houston when the shelter-in-place order was issued. Fire crews continued to douse several destroyed storage tanks with water and foam at Intercontinental's facility to cool the smoldering remnants. Royal Dutch Shell Plc told workers at its nearby 275,000-barrel-a-day Deer Park refinery to stay at home or remain inside if they'd already arrived at work. The refinery's operations are normal, said Ray Fisher, a Shell spokesman. "This is a real risk to human health, not theoretical," said Elena Craft, senior director for climate and health at the Environmental Defense Fund. "Benzene is a known carcinogen, and no amount is safe to breathe. We urge everyone, especially pregnant women, to be vigilant." "It's still very warm from the fires," she said. "We are sending a drone over to see the temperatures right now, so everything is evolving. But this was a fire, and it takes a little bit of time." Before the fire, Intercontinental's tank farm could hold as much as 13 million barrels of oil products and chemicals along the Houston Ship Channel. The black smoke plume that towered over Houston posed no risk to residents, local official said. When ignited, benzene "just burns into carbon dioxide and water, just like anything else," Dr. Stephen Harding, assistant professor of emergency medicine at Baylor College of Medicine in Houston. "Once you've controlled the fire, you've now got damaged tanks containing the benzene which may be leaching into the air, now that it's no longer being burned off."